EDF Renewable Energy has signed an agreement to supply Google, a subsidiary company of Alphabet with 200 MW of wind energy generated from the new Glaciers Edge Wind Project in Iowa. anticipated in December 2019, the Glaciers Edge Wind Project, located in Cherokee County in the northwest portion of the state, is expected to create more than 150 jobs during the construction phase along with millions of dollars injected into the local economy. Glaciers Edge Wind Project, located in Cherokee County in the northwest portion of the state, is expected to create more than 150 jobs during the construction phase along with millions of dollars injected into the local economy. Once the wind farm comes online, anticipated in December 2019, the additional capacity will help Google reach its goal of purchasing enough renewable energy to match its energy consumption for global operations. 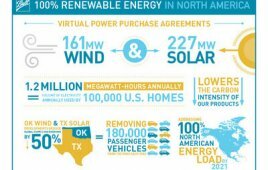 EDF RE and Google forged a relationship in December 2012, when Google made an approximate $200 million equity investment in EDF RE’s Spinning Spur Wind Project, located in Oldham County, Texas. The business partnership progressed in 2016 with the power purchase agreement for the Great Western Wind Project in Oklahoma which supplies Google with 225 MW of clean electricity. EDF RE is a leading developer among corporate buyers of renewables which demonstrates the trust that environmentally-conscious companies place in EDF RE to deliver value. The Company’s growing North America portfolio of corporate purchasers includes Google, Microsoft, Salesforce, Procter & Gamble, Kimberly-Clark, Walmart, and Yahoo. Glaciers Edge will bring the EDF RE’s portfolio of wind project development in Iowa to 1.1 GW.